Choosing between Kettlebell Kitchen and Silver Cuisine By BistroMD, you are faced with a rather difficult task. Both services have unique qualities that make them highly popular among hungry customers nationwide. However, that does not mean that the choice is impossible to make, as one of these services does have a bit more to offer. Our Kettlebell Kitchen VS Silver Cuisine By BistroMD comparison below allows you to discover what it is that makes these two services different from each other, as well as which one constitutes a better choice. Silver Cuisine By BistroMD has a rich menu featuring healthy, budget-friendly meals particularly designed with the nutritional needs of seniors in mind. Silver Cuisine By BistroMD features one rotating menu for its customers to choose from. Silver Cuisine By BistroMD offers more than 150 meal options on its menu. Silver Cuisine By BistroMD allows you to choose from a vast variety of breakfasts, lunches, dinners, shakes, and snacks. You can opt for heart-healthy, gluten-free, diabetic-friendly, low-sodium, low-carb, menopause-friendly, dairy-free, and vegetarian dishes. The meals are rarely exotic and mostly belong to the classics category. Silver Cuisine By BistroMD offers physician-designed, chef-crafted meals made of fresh, top-quality ingredients. The meals are frozen as soon as they are prepared to lock in the flavors and nutrients. 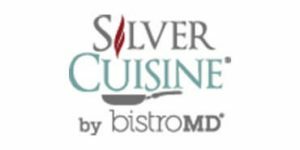 Silver Cuisine By BistroMD meals are nutritionally balanced, with 20-25% of calories coming from healthy fats, 30-35% from complex carbs, and 40-45% from lean protein sources. The average calorie count is 290 per serving. The meals usually contain around 600 mg of sodium. To set up a recurring weekly order and get more information about subscription flexibility, you have to contact Silver Cuisine's parent program, BistroMD. If you are not satisfied with your order from Silver Cuisine, you must notify the company within 30 days of your delivery and you may receive a refund. Silver is my best friend now! My Mom lives in Jersey and I can’t go over there every day to cook for her since I live in NY with my family and I need to take care of them too. She’s been on her own for the last 3 years and Silver really helps. She even orders herself now, doesn’t need my help and explanations. I like the flexibility and the menu, so many options! I’d like if they could deliver daily and the food wasn’t frozen. If that’s possible, pls think about it. I know my dad would appreciate it. Eating a healthy diet can prevent many illnesses and improve our health and well-being. Proper nutrition is particularly important for seniors. This is why Silver Cuisine by BistroMD developed meal plans to meet the different dietary needs of older adults. Read our objective Silver Cuisine by BistroMD review to learn more.